Companies like Sensaphonics love to keep it low key when it comes to product launch, which is probably why not much info about their already-in-market-for months, brand new, company's first universal dual balanced armature IEM. 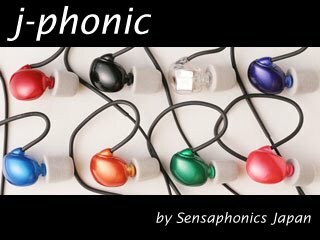 It is the brainchild (*see update below) of Sensaphonics Japanese devision, named the j-phonic K2. Though it is an universal IEM, it has quite tons of customizable features. First, you get to choose whether you want a stage monitor or music listening tuning (sound signature wise), then there are 8 colors on housing to choose from, follows by 3 different length in cable, 2 different style of 3.5mm plugs (straight or L-shaped), 2 different style of Comply eartips (3 sized T or TX series, total 6 pairs) and 2 different size of hard case with 3 different color options in rubber lining - a total of 1152 different combinations, WOW! That really blows my mind off since this is just an universal IEM. This is a model specially designed for the Japanese's ear shape which is different from the Western developed products that the company originally sells, but I don't see why it won't fit the rest of the world as well. MSRP in Japan is almost $500 with shipping included - a bit on the expensive side but I think it is still worth it, consider how much effort Sensaphonics Japan has put into the j-phonic K2. [UPDATE] Got words from Sensaphonics Japan. They want to point out that Sensaphonics Japan itself is not responsible for the manufacturing of j-phonic, but only the marketing. Rather, this IEM is a combined work of several top Japanese designers and experts in the various fields. They are in process of setting up a English site and bringing this IEM to the international market, but price has not been fixed yet as they are still seeking way to lower the impact on recently heighten JPY to USD exchange rate.